Earlier this fall, individuals who were on the TravelSmart interest group mailing list plus registered TravelSmart participants received a feedback survey. If you took that survey, THANK YOU! The information you provided was very helpful and not only lets us know what’s going on, but will help us to make improvements in the future. First things first: the winner of the $50 gift certificate to eCreamery is Diane Landon! Almost 700 people took the survey. 77% of participants use TravelSmart to get to work/school 3-5 days a week. 40% of participants have never used active transportation to travel to campus prior to TravelSmart. They also care about reducing pollution, improving their health/reducing stress, avoiding the hassle of parking and traffic. Approximately 18.6% of employees and students on this campus use active transportation to come to campus or people who work from home. This is an increase of 5.7% over the 12.7% baseline, and pushes us closer to our 20% goal in the Sustainability Master Plan. On any given workday, 293 parking stalls are available to others on campus because of people using active transportation. Pretty great, huh? But wait—there’s more! By using active transportation, TravelSmart participants are saving approximately 8,182 single occupant vehicle miles (miles that would have otherwise been taken by an individual driving a car) PER WEEK. Do you know how far that is? 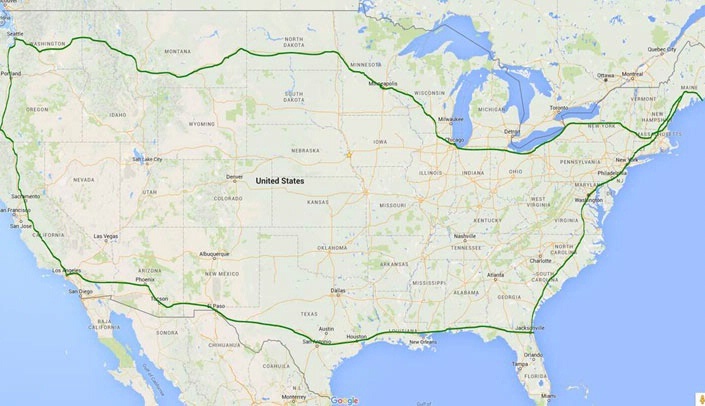 You could drive from Bar Harbor, Maine, to Buffalo, Chicago, Minneapolis, Seattle, L.A., Phoenix, San Antonio, Houston, New Orleans, Jacksonville, Washington D.C., Philadelphia, New York, and back to Portland, Maine, with miles to spare. If you are counting, that’s 33 states! And that’s just one week! If you extrapolate that out to year, it’s the greenhouse gas emission from 57.2 tons of waste in a landfill, or CO2 emissions from producing electricity for 21 homes, or the carbon sequestered by 3,952 tree seedlings grown for 10 years! That reduction in pollution helps to prevent asthma attacks, cancer, and premature death, while helping those with COPD and other respiratory diseases. Way to go TravelSmart Participants! Don’t forget, if at any time you have any questions, concerns, or feedback about the TravelSmart program, whether you are registered or not, please don’t hesitate to contact travelsmart@unmc.edu . Next Next post: Climate Change Here?